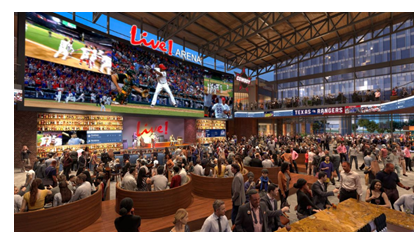 ​​​​ARLINGTON – On March 2017 ground was broken on Texas Live!, the $250 million dining, entertainment and hospitality district, located near the new Texas Rangers’ Globe Life Field. The $250 million project will have 200,000 sf of restaurants, retail and entertainment venues and an outdoor event pavilion. It will also have a 300-room hotel with 35,000 sf of meeting space. Click here to see DFW Retail Market Research​.